FOX’s soap opera/reality series Nashville is the winner — though not in a good way. It’s the first new series of the 2007-08 season to be pulled from the primetime schedule. 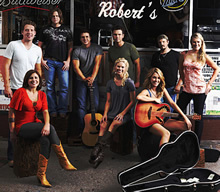 Nashville debuted on September 14th and follows a group of aspiring country singers as they navigate their way through the Tennessee music city. Participants include Jamey Johnson, Matt Jenkins, Lindsey Hager, Jeff Allen, Clint Moseley, Chuck Wicks, Rachel Bradshaw, Mika Combs, and Sarah Gunsolus. The series debuted to a disappointing 2.7 million and viewership dropped to 2.2 million the following week. As a result, FOX has pulled the show from the schedule effective immediately. Encore airings of K-Ville will take over the Nashville slot on Friday nights for the next two weeks. After that, The Next Great American Band will take over the night with three two-hour episodes. FOX maintains that episodes of Nashville will “be rescheduled at a later date.” Based on the network’s revised schedule information, the first available Friday night timeslot is November 9th but I wouldn’t hold your breath. Stay tuned! I wonder if you can find these episodes online anywhere. I am sure they made more than two. Hey I never actually saw the show until today, and I happened to have loved it, especially since i saw Chuck Wicks perform at the Brad Paisley show. I think it needs to come back on because I would like to know what happens. Dont Worry jimi…We thought “Nashville” was a great show.It wasnt bad but it was your sponsors that couldnt hold out. We think you ought to pitch it to CMT.. They will take it Im sure….Just keep trying…You have a Goldmine here!Good things come to those who have patience.We back you 100%…..Staff/crew in waiting. I also enjoyed the show. Once again I get sucked into watching an on-going serial program only to see it pulled like Vanished last season. Makes me leery starting to watch other FOX programs – afraid they made be pulled once I have a vested interest in the programs. I really liked this show. I am not a big fan of country music but I thought it was good show. When I tuned in the third week and no Nashville I was disappointed.I must admit I started watching the show b/c nothing else was on TV. I think that 2 weeks is not enough time. Put Nashville back on I know I will definately watch it. So not fair…. i really loved this show… Bring it back!!!!!!!!!!!!!!! !